A really convenient way to get to Nangang is by MRT. In previous years the underground stopped just 1km short of the Exhibition Hall. This meant you had to get up to the main road and wait for a shuttle bus. No more. Now you can get the MRT all the way. For example, I’ll be staying in the Shi-Lin area in Taipei’s North district close to the Red Line that runs North-South through Taipei. I’ll get on at Ming De or Zhi Shan, go to the Taipei main (interchange) station, change to the Blue Line and take a train East to what is now the terminal station at Nangang. That’s about a 40min journey. Wherever you are staying in Taipei an MRT station will probably be not too far away – very convenient. One other thing about this is that every station has a public toilet. This is something that is very hard to find otherwise. You don’t need the added stress of discovering this should nature call when you are in-transit somewhere in the city. 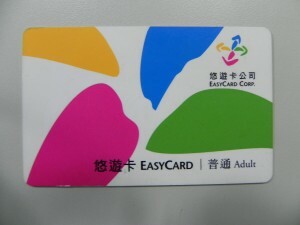 To make entry and exit to the MRT very easy and smooth you can purchase an Easy Card for NT$400 (USD 13.60) and return it when you are finished for a refund. You can add value to it at any MRT station. You can also use it at any convenience store to obtain basic items. Buy one directly from the station staff or the vending machine that is located at the station.